The ADA Shower Trailer Portable Restroom +2 Station Combo | Oahu Series features a designer interior complete with coordinating accents! This shower trailer unit is features 2 standard unisex suites, and 1 ADA suite, which can also be utilized as a family suite. Each standard unisex suite contains 1 pedal flush china toilet (with pedal blocks), shower stall, pedestal sink, and shatterproof mirror. The ADA-compliant unisex suite includes 1 wheelchair-accessible shower, sink, grab rails, and ADA toilet with mounted push button control module. More features of this trailer includes a hydraulic lift system allows the entire restroom trailer and ramp to lower to the ground with the push of a button! Also included is a 300 gallon waste tank, 105 gallon freshwater tank, an on-board water heater, and air conditioning and standard heat package. The shower trailer is constructed with an aluminum exterior, durable and easy-to-clean FRP interior walls, and upgraded LED lighting. 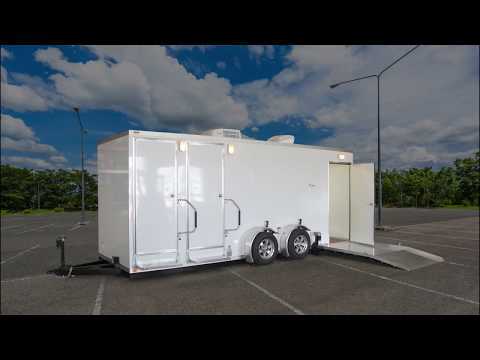 Download a 1 page PDF Product Description for the ADA Shower Trailer Portable Restroom + 2 Station Combo | Oahu Series from Portable Restroom Trailers, LLC.